ON THE course he designed, David J Russell was worried he might embarrass himself in front of his peers. He also had the added pressure of having the “boss” as his pro-am partner. In the circumstances, it was a splendid effort by the 61-year-old to emerge from the opening round of the £250,000 Prostate Cancer UK Scottish Senior Open at Archerfield Links sitting in a share of the lead. On a blustery day on the East Lothian coast, Russell overcame what he described as “funny nerves” to sign for a two-under-par 70 on the Fidra Links, an effort that was subsequently matched by Australian Peter O’Malley, who will forever be remembered in the home of golf for denying the Saltire-emblazoned Colin Montgomerie in the 1992 Scottish Open at Gleneagles, and unheralded Englishman Gary Marks. Eight players, including Scottish-born duo Stephen McAllister and Gordon Manson, are sitting on one-under, but there was no denying that the man wearing the biggest smile on emerging from the scorers’ hut belonged to Russell. A Brummie, he’s had an association with this venue since 2001, when he started to lay out the first of its two courses for owner Kevin Doyle, and now lives in East Lothian. Yet, while he knows the layout being used for this week’s 54-hole tournament better than anyone, yesterday was a new experience. “It was strange because I don’t think I’ve marked a card professionally here before, so that was a bit daunting, especially when I know where all the trouble is,” revealed Russell. According to playing partner Gordon Brand Jnr, the host did himself proud. “You could tell he knows the course like the back of his hand, especially on the greens,” said the Scot after a 72 that mirrored Russell’s effort in the sense that both raced to the turn before trying to limit any damage on the more exposed back nine. With Doyle as his partner – the pro-am section concludes today before the stage is left for the professionals in the final round – he was delighted to get into red figures early on with an eagle-3 at the second. “That settled me down,” said Russell of reducing the 503-yard hole to a drive and 7-iron then knocking in a 12-foot putt. Boosted by a top-10 finish in Germany in his last outing just over a month ago, Marks came home in three-under 33 and would have held the outright lead if he’d been able to convert an eight-foot birdie putt at the last. Nonetheless, it was a good day’s work for the 51-year-old Londoner, who was a regular parishioner at the European Tour Qualifying School but never managed to go the full distance in that marathon test. While Manson, who was born St Andrews but is now an Austrian citizen, achieved that feat in the Swiss Seniors Open earlier in the season, starts have been few and far between for McAllister on the over-50s circuit this year due to his ranking. In fact, he needed an invitation to get into this field. 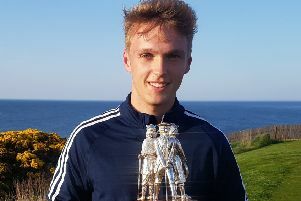 “I’ve been playing on the Tartan Tour to keep myself competitive and it is good testing yourself against a lot of the young lads,” said the Paisley man, a one-time Archerfield Links member but now flying the flag for the neighbouring Renaissance Club.